Getting married in the fall is the perfect opportunity to use all those rustic colors and elements you love so much. Browns and reds, pumpkins and leaves—you want it all! But what if you’re planning a fall season wedding and are also a fan of Halloween? Sounds like it’s time to consider a Halloween wedding! The thing to remember is that it’s going to be a wedding, not a wild Halloween bash. As such, look to ideas for a Halloween-time wedding that scream sophistication, not ones that leave your guests screaming in terror. Understand Halloween weddings: When pointed in the right direction, your Halloween-themed wedding ceremony or reception will come off elegant, glamorous and sophisticated, a little mysterious with a pinch of spookiness. The key to pulling off a memorable Halloween wedding is to steer clear of traditional Halloween plans and decorations. Instead, pull the best ideas from the fall season and colors from Halloween. Don’t make it a costume party: Your Halloween-time wedding should be a wedding celebration, not a costume party. So, don’t ask your guests to come in costume as if they are attending a spooky Halloween party. What you can do is add a touch of Halloween by providing Halloween masks in a designated photo booth area. Additionally, a bride’s wedding dress is also not a costume. Ditch the scary bride idea and opt for something like a beautiful vintage gray lace gown, or a modern black wedding dress. Apply the same concept to your bridal party’s wardrobe. Choose a color palette to match the season: Use a sophisticated color palette in your Halloween wedding plans. For example, if you love classic orange and white pumpkins, consider burnt orange and gray-silver instead. Black and browns are also popular choices. Use these as the main colors of your wedding and make it all pop with burgundy, deep greens and reds. Utilize candlelight: Not only is getting married by candlelight romantic, it’s also a wonderful element to include in your ceremony. Ditch the electric lighting and (safely) light a bunch of candles near where you are to say your vows. In keeping with the Halloween spirit, set up candelabras around the reception area and pillar candles as centerpieces on each table to create a spooky abandoned mansion feel. Incorporate black blooms: Whether or not you use candles as centerpieces, black flowers will make a great addition. Many blooms are available in black, including roses, dahlias, tulips, calla lilies and more. Black blooms also look stunning in Halloween wedding bouquets. Have themed food and beverages: Fill your Halloween-time wedding with the flavors of fall. For food, snacks and drinks, think of menu items like butternut squash soup, apple tarts and popcorn balls, dishes with pumpkin, apples, cinnamon and pecans and a dark chocolate covered wedding cake. 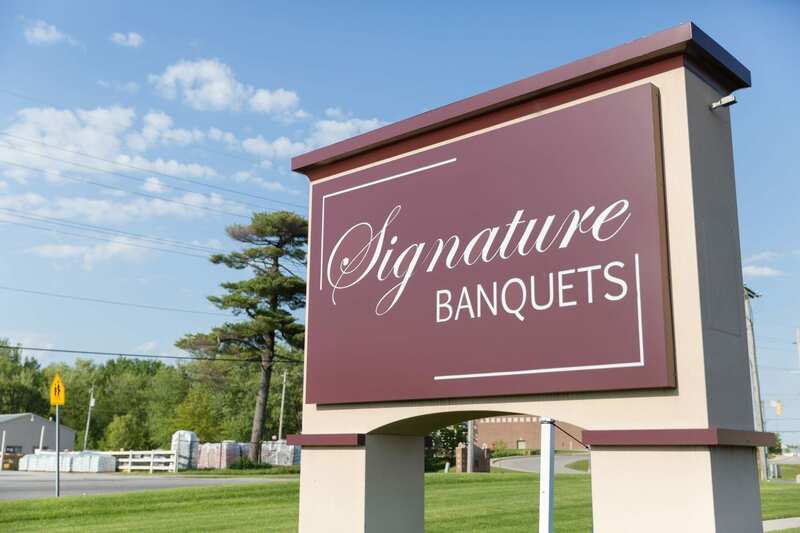 If you need a wedding planner in Northwest Indiana to help you organize your Halloween wedding, don’t hesitate to call Signature Banquets!